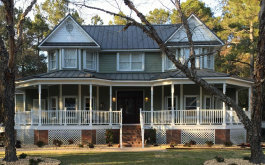 The Lee's had a local cabinet maker build doors for an existing cabinet in their Victorian style home in Gulf Shores, Al. They loaned me the doors to design & build some glass door inserts with bevels to accentuate their beautiful bar area. Since the doors were different sizes, we came up with 2 different designs to complement each other. We used clear granite back glass on the border and clear seedy glass for the interior background and star bevels to tie both designs together. Two of the doors have a script "L" in opalescent glass and the other two doors feature a bevel cluster in the center. 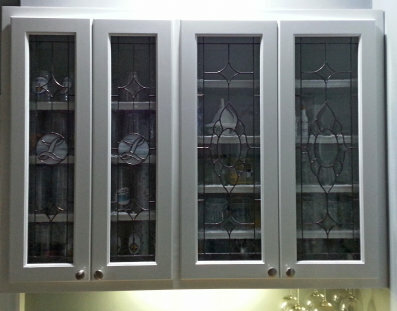 The smaller door insert measures 6.5" x 29.5" and contains 35 pieces of glass. 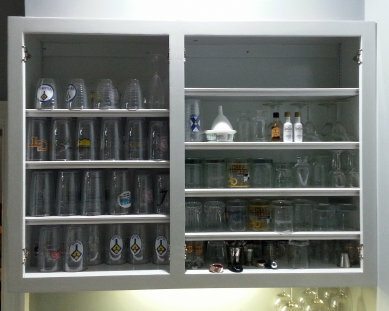 The larger insert measures 9" x 29.5" and contains 33 pieces of glass. These cabinet door inserts were completed and installed in January, 2016.